When the first Gaels came across (to Iona), the original people here were the Indians. The Gaels came over and they had only a small crew. When they made land with their boats, the Indians were ahead of them. Since the Indians were there before them, the Gaels perceived that there was going to be difficulty and that the Indians had no wish to befriend them. The poor Gaels, considering their number and that of those against them, saw there was little they could do. The one thing they thought is that it would be be best for them to make their peace with God considering their inferiority in manpower. They crossed themselves, and when they blessed themselves, the Indians noticed what the Gaels had done. The Indians then knew that the Gaels were Catholics. However, the Indians had been deceived so often...but they had to find another way of asserting if indeed the Gaels were Catholic. Did they possess anything that would prove they belonged to the Catholic faith? One of the Gaels opened a small trunk and he took out a cross. He held the cross up. When he raised the cross, the Indians shook hands with the Gaels, realizing they were of the same religion. Since they were on the same side, the Indians had no wish to make any further trouble. They saw that it wouldn't be fair of them because of their superior numbers. It happened that the Indians had a good many eels, and they decided to make a great celebration. This was done, but the Indians weren't using salt. But the Gaels themselves...they were afraid of the eels the Indians were giving them because they had been fooled once before by people giving them snakes for food instead of eels. However because the Indians were so kind, their intentions were so good, the Gaels offered them salt. The Indians tried the salt on their food and they liked it very much. They asked if the Gaels could give them any of their salt. That could be done if the Indians had some way of holding the salt. This was no difficulty for the Indians because they had birch bark. They made...they stripped the bark and folded it. This was their way of containing the salt. 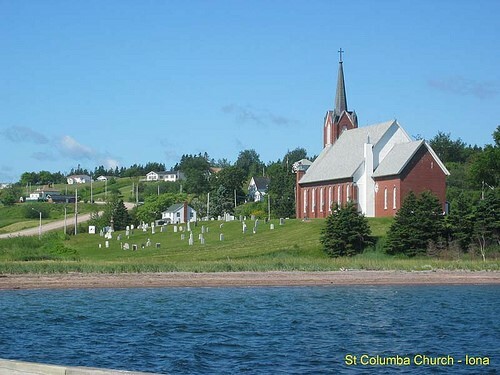 Now to bring things to a conclusion, on that same location where the Gaels met the Indians, a church was built in that very spot (St. Columba's Church). As printed in Am Bràighe Vol 1. Summer, 1993. See: p.10 in Folklore of Nova Scotia by Mary L. Fraser.